While some craft artists find working hand in hand with others challenging, for some it is both a necessity and a pleasure. The artists at Pilchuck School of Glass and the quilters at Mississippi Cultural Crossroads could work alone if they wished; however, both prefer to work in collaboration with others. In this section of Education Guide: Community, students will learn the importance of collaboration among craft artists. Collaborative artists know that by working hand in hand with others they can create beautiful hand crafted objects that realize a common goal and reflect a shared vision, imbued with the spirit of collaboration. The amazing thing about the glass community in general is that it is very much about the spirit of cooperation. I think that that energy is transferred into the piece. Take a moment to think about how many things you do on a daily basis that involve the contributions of others. Although our society often emphasizes independence and self-sufficiency , there are, in fact, countless things that we do on a daily basis that are best accomplished through collaboration with others. Throughout their school career, students are encouraged to work with others by playing sports, singing in the choir, or joining a club. Students need to know how to cooperate with others and understand that collaboration can be beneficial and useful in a variety of contexts. But why collaborate? Why not work alone? Sometimes people work together because a task is too large to be accomplished single-handedly or because the project requires the expertise of others. Regardless of the reason, when collaboration happens, a certain spirit of cooperation develops, the energy of teamwork emerges, and more is accomplished than when working alone. Collaborative practices can take many forms. In some situations collaboration offers mentoring and teaching opportunities, while in other instances a group learns together, simultaneously. Peer to peer and intergenerational learning can also take place, depending upon the context. Regardless of the group structure or goal, a collective vision should underpin everything the group does. Without a collective vision, working hand in hand with others will prove challenging. The group must remain focused on the vision and goals, respect one another’s opinions and expertise, be prepared for a little “cooperative competition,” and understand that interaction with one another is key to realizing their goal. In true collaborative practice, the experience, the people, the process, and the result can create opportunities, inspire you, and take you in directions you never anticipated. 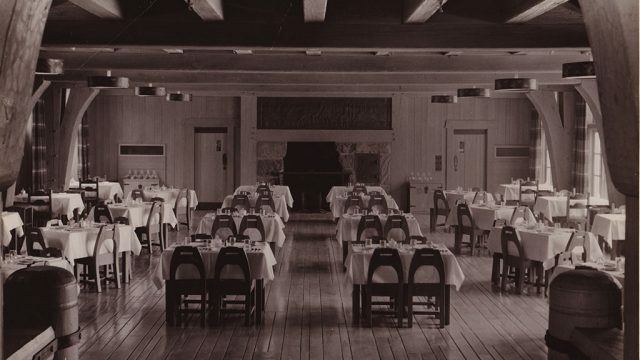 Over the course of sixteen days in 1971 a group of glass artists came together to build Pilchuck School of Glass. Here, the creation of beautiful handcrafted glass objects remains a truly collaborative practice. 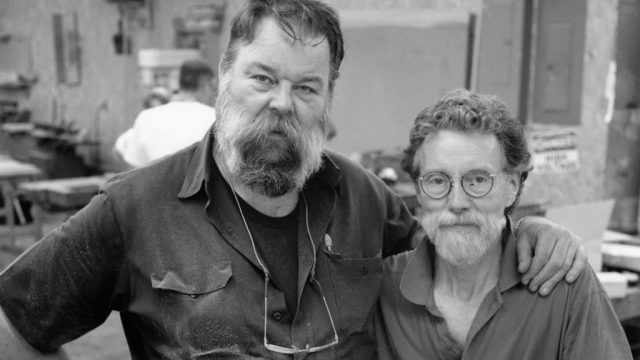 Guided by the founding vision of renowned glass artist Dale Chuhuly, Pilchuck has evolved into a school where students and teachers come together to share their passion for glass making, support one another’s creative vision, and work hand in hand. Whether the production of one piece of glass involves a few or many people, everyone at Pilchuck is part of the community, part of the glass family. Glassmaking is like performance art. There is a show-must-go-on attitude. When the furnaces are hot, the dance begins, with each person performing her part. 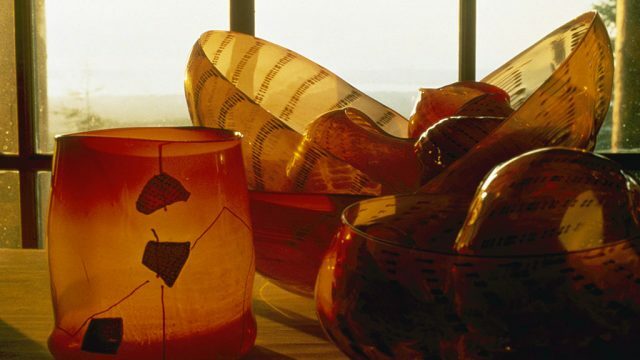 They come together to realize a common goal–to create a beautiful glass piece that reflects the vision of the artist. Teamwork is a fundamental aspect of glass blowing, which, like the molten glass itself, is fluid. Each helper adds to the piece in one way or another. To work with glass, artists must be open and responsive to the changes that may occur as the piece evolves. Artists who have taught and studied at the school affectionately refer to the “Pilchuck bubble”—a little microcosm of creativity, community, and collaboration that changes lives. Everyone is welcome at Mississippi Cultural Crossroads (MCC). Since its inception 1978, the center has been bringing women of all ages and ethnicities together to celebrate the region’s traditional arts. In 1986, master traditional artist Hystercine Rankin introduced quilting to the center; since that time, MCC has been at the forefront of preserving the art of quilting in its community and beyond. The women do not quilt alone. They may design their patterns and sew their squares at home, but they always come to MCC where they work side by side with other women to finish the quilt. These women of all ages, backgrounds, and skills are there because they share a passion for quilting and they know that the other women will help them realize their creative vision. Mentoring is an important aspect of what happens at MCC—women teaching women, giving advice, passing on traditions. While at MCC, they focus on the work at hand and share techniques, but there is always time for socializing and telling stories. To the delight of all who are a part of MCC, the center has grown far beyond its original purpose. While it continues to celebrate the traditional arts of the area, it is also a place where the spirit of collaboration thrives. While some craft artists find working hand-in-hand with others challenging, for some it is both a necessity and a pleasure. The artists at Pilchuck School of Glass and the quilters at Mississippi Cultural Crossroads could work alone if they wished; however, both prefer to work in collaboration with others. What is it about the act of collaboration that appeals to these artists? They know that by working hand in hand with others they can create beautiful handcrafted objects that realize a common goal and reflect a shared vision, imbued with a spirit of collaboration. Craft artists who work with others truly understand the benefits of collaboration. Have students view the DVD segment on Pilchuck School of Glass or view online at www.craftinamerica.org/shorts/pilchuck-glass-school-segment. Before viewing, provide them with an overview of the segment. Explain that they are going to visit a craft school that specializes in teaching glassmaking processes and techniques. Provide students with some basic background information about the school. Then, simply ask the students to keep the word “collaboration” in mind as they watch the segment. After viewing the Pilchuck School segment, engage students in a discussion about glass art forms and collaboration. Possible questions include: Do you know anyone who works with glass in any way (stained glass, painting on glass, etc.)? Have you ever seen glass being made before? What do you know about glass blowing? Have you ever made glass or watched it being made? What did you find interesting or appealing? What else would you like to know about it? Now focus the discussion on collaboration: Where did you see collaboration? Who was collaborating? What were some of the different roles? What are some other words that we can use in place of ‘collaboration’? What were the artists making? How is collaboration necessary for the artists to create their work? Could they work alone? Why or why not? Next, have students watch the segment on Mississippi Cultural Crossroads (MCC). View online at www.craftinamerica.org/shorts/mississippi-cultural-crossroads-segment. Provide them with basic background information about the center. Ask them to watch this segment while paying attention to both the art form and how the women collaborate. 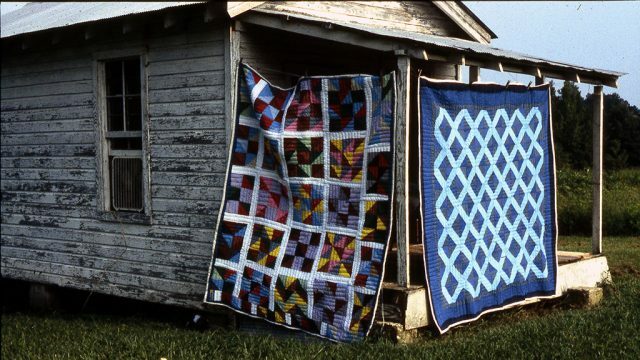 After viewing, ask students: Do you know anyone who quilts? What do you know about quilting? Have you ever quilted or watched it being done? What did you find interesting or appealing? What else would you like to know about it? Now focus the discussion on collaboration: Where did you see collaboration? Who was collaborating? What were some of the different roles? How is collaboration in quilt making the same and/or different from glassblowing? How is collaboration necessary for the artists to create their work? Could they work alone? Why or why not? View additional DVD and web segments on Pilchuck School of Glass and Mississippi Cultural Crossroads. Examine DVD or web segments for other artists and art forms that explore the theme Collaboration. How do these artists collaborate? Do their art forms require them to collaborate? Compare and contrast Sam Maloof (woodworker/MEMORY), Denise and Samuel Wallace (jewelry/COMMUNITY), and Timberline Lodge (various/LANDSCAPE) with Pilchuck School of Glass and Mississippi Cultural Crossroads. 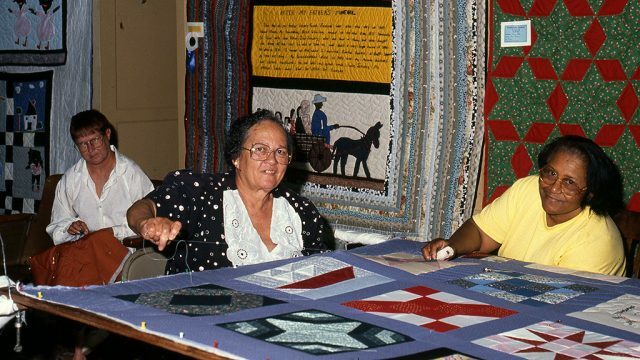 There are many other quilting groups and communities in the United States and throughout the world. While some are traditional, others take a more contemporary approach. Have students investigate Quilt National (www.quiltnational.com) and The Peoples’ Place Quilt Museum (www.ppquiltmuseum.com) to compare and contrast the quilts found on these websites with those created by the artists at Mississippi Cultural Crossroads. Divide the class into five groups. Assign each group one of the featured or related artists, schools, or centers to investigate further: Mississippi Cultural Crossroads (quilting/COMMUNITY), Pilchuck School of Glass (glassblowing/COMMUNITY), Sam Maloof (woodworker/MEMORY), Denise and Samuel Wallace (jewelry/COMMUNITY) and Timberline Lodge (various/LANDSCAPE). Have students use the Models of Collaboration worksheet to guide their research (Community: Hand in Hand Worksheet #1). Once students have completed their investigation, engage them in a group discussion about what some of the benefits and drawbacks of collaboration might be. Students should refer to their research to support the discussion. Deepen the conversation by having students talk about some of the subtleties of the observed collaborations. For example, explore the relationships that bring people together at Mississippi Cultural Crossroads, people who due to ethnic and social differences might not otherwise collaborate. Ask students: How do these collaborations go beyond the crafts process to impact a larger community? Do you engage in any collaborations that not only benefit you, but the larger community (e.g., team sports, youth groups, clubs, etc.)? Have students engage in a collaborative craft project. Students could work together to make ceramic tiles that could then be joined to create a mural or they could work collaboratively to make a quilt. When the project is complete, have students display their work and engage in a discussion about the collaborative process: What worked and what did not? What were the benefits of working together? Would it have been easier to work alone? Why or why not? Since no one student can own the project, you might consider raffling it as a fundraiser for the class or school or displaying it an common area within the school. Take the conversation back to the larger theme presented using the reflection sheet Collaborators Wanted (Community: Hand in Hand Worksheet #2). Have students fill in the blanks to create a help want ad that reveals their understanding of the characteristics and benefits of working collaboratively. Ask you students if they know about the AIDS quilt project. Have them find out more: Who creates it? How does the project work? Who is in charge? Who looks after the quilt? Who are the collaborators? What’s the purpose/goal? How will they know when they have reached their goal? Where has it been in your region? Will it be coming back? Have your class investigate hosting the quilt in your region. Have students find out more about collaboration through visits to places where they will find craft artists (e.g., craft shows, fairs, festivals, bazaars, etc.). Have them look for artists who collaborate and interview them about their work together.